As homeschoolers, we have plenty of freedom, including how we develop our school schedules and how we decide to cover each subject. One of the best ways to use this freedom is to enrich our local communities through volunteering. Since homeschooling families often have flexible schedules, there are plenty of ways they can get involved in their neighborhoods, towns, and cities. 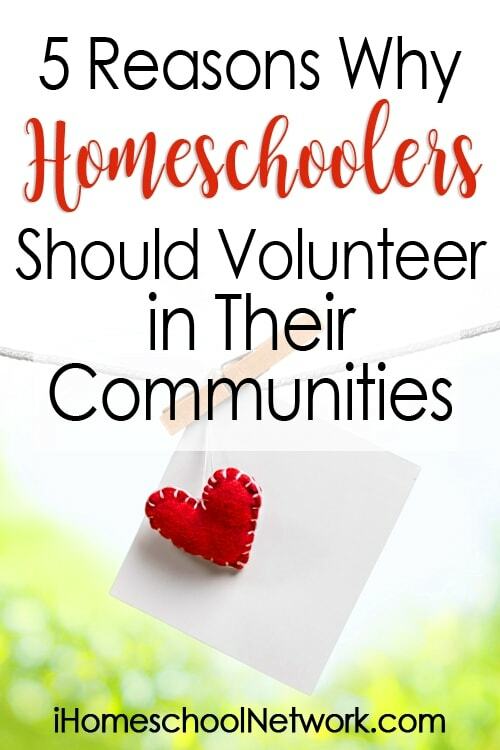 But why is volunteering a good idea for homeschoolers? Here are five reasons for homeschoolers to volunteer in their communities. Volunteering helps kids learn about others. When kids volunteer, they get a chance to broaden their understanding of other people. Depending on the event, they may meet people who are living with different financial circumstances, who are from different areas, or who are living with different physical abilities. Meeting new people can help children understand that everyone doesn’t live the same way they do, which can help them learn new ways of looking at the world. Volunteering helps children learn empathy. If you volunteer at a facility that services the underprivileged in your community, working there will help the kids realize that there are people who are living with far less than they are. This experience is a wonderful foundation for teaching them to feel concern for others and develop a willingness to help. Children who volunteer learn valuable life skills. When you sign up to volunteer locally, you give your children a chance to develop important life skills. For example, if you offer to help clean up a local park, the kids will learn basic lawn care skills. If you work in a soup kitchen, children can learn how to cook and serve food. These are skills that will serve them well in the home and as they grow up and make a life of their own. Working in the community gives children a connection to their neighbors. It’s one thing to teach a homeschooling lesson about neighborhoods, but it’s quite another to get involved in your neighborhood and get to know the people who live around you. Volunteering gives children a chance to work alongside their neighbors and accomplish something that makes everyone feel good. Your kids may even establish friendships with neighbors that last for life. Volunteering is a great way to help children establish a work ethic. The majority of volunteering opportunities include plenty of hard work. And if your kids are a little less than motivated to work around the house, working in the neighborhood can inspire them to do their very best at whatever they undertake. Working with a group and seeing the results of their hard work can give kids a feeling of satisfaction they will treasure. No matter what volunteering opportunity you choose, your family will learn some important life lessons along the way. As you work together to help make your community better, you’ll see how volunteering strengthens your bond as family members and as local citizens. Selena is a tax accountant, a writer, and an A.D.D. homeschooling mom to four super special children. She shares educational printables and writes about homeschooling children who have ADHD every week at Look! We're Learning! So true! I love volunteering and our very favorite place to volunteer is a horse rescue near our home.